Born in Paphlagonia, 949; died at Constantinople, 1022. Saint Simeon is venerated by the Orthodox Church at Constantinople, where he was raised. 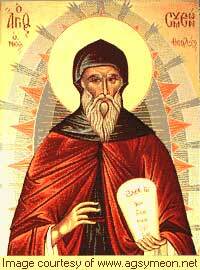 He was a monk of the Studius who migrated to St. Mamas Monastery in such of a more austere life. He become its abbot and ruled for 25 years. His strictness was met with animosity, so he organized a new community. 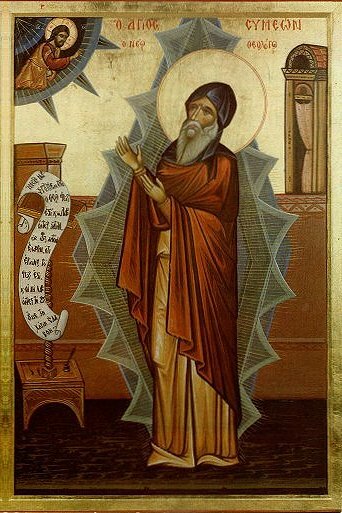 In Saint Simeon, Byzantine mysticism reached its peak; he followed the spiritual tradition of Saint John Climacus and Saint Maximus the Confessor. Recently his writings have generated interest among Western students (samples can be found in E. Kadloubovsky and G. E. H. Palmer's Writings from the Philokalia (1951)). Simeon is called the "new" theologian to indicate his place in the Orthodox Church as a successor to Saint John the Evangelist and Saint Gregory of Nazianzus (Attwater). Christianity > Orthodoxy, Abbot Vasilios of Iveron Monastery, Athenagoras, Diadochos of Photiki, Hesychius of Jerusalem, Nicephorus the Solitary, Saint Evagrios the Solitary, Saint Gregory Palamas, Saint Hesychios the Priest, Saint Isaac the Syrian, Saint Mark the Ascetic, Saint Seraphim de Sarov, Saint Symeon the New Theologian, The Philokalia, Unknown, etc.